PT. 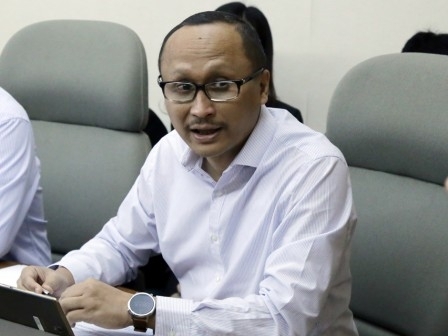 Jakarta Propertindo (Jakpro) Director, Satya Heragandhi informed, Light Rail Transit (LRT) project construction progress has reached 63.01 percent by February 15, 2018.
" While another eight LRT cars will be prepared to operate by the end of July 2018"
"Its work preparation has completed 100 percent, infrastructure main construction reaches 62.92 percent, facility rolling stock construction reaches 59.21 percent. Overall it reaches 63.01 percent," he explained, Thursday (2/22). He added, facility construction has been started in December 2016 and targeted to complete in August 2018. While for testing and commissioning are targeted to start in early May 2018. Then for rolling stock procurement contract has been started on February 1, 2017 and targeted to complete in October 2018. First train has painted in October 2017 in Korea. The first two train cars will be arrived in Jakarta at least in April 2018 and ready for testing and commissioning. "While another eight LRT cars will be prepared to operate by the end of July 2018 and next eight LRT cars will be ready to operate by the end of October 2018," he conveyed.